International Journal of Advances in Nursing Management (IJANM) [ISSN-2347-8632 (Print); ISSN-2454-2652 (Online)] is an international, peer-reviewed journal devoted to nursing sciences. IJANM's aim is to promote excellence in nursing and health care through the publication of clinical information and original research. 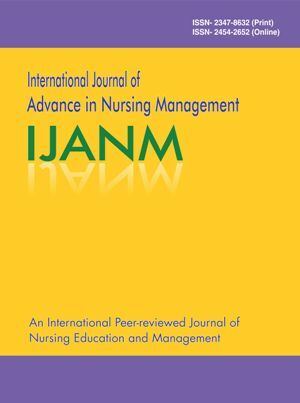 IJANM publishes Original Research Articles, Short Communications, Review Articles in all areas of nursing sciences. Online since Monday, Feb 11, 2019 Accessed 2188 times. A Study to Assess the Knowledge of School Going, Children regarding Road Safety Measures, in Selected School, at Mangalagiri, Guntur District, A.P.